A diamond ring is not only gorgeous but often expensive. It’s important to learn how to care for the diamond and the setting around it to ensure that the ring stays in pristine condition. A clean diamond is a sparkling diamond, which will also get you noticed more often. 1. Mix a little ammonia in warm water, and add some mild dishwashing liquid. f your diamond has been fracture filled, don’t use ammonia as it may harm the filling and the coating of the stone. 2. Make sure you don’t use anything that contains bleach as it may damage metals such as gold or platinum. Even when you wear your jewelry, you shouldn’t let it come in contact with chlorine, which can be harmful to your pieces. 3. Use a soft toothbrush to remove the dirt that has accumulated in the crevices of the ring. Brush the ring gently so as not to loosen its prongs. 4. Make sure you clean the lower part of the diamond, as the base of the mounting underneath the stone is where a lot of dirt builds up. 5. Rinse the ring with water and dry it with a soft, lint-free cloth. 6. Clean your diamond ring once a week or once every two weeks. If you wait longer, the dirt that accumulates can harden and you may not be able to clean the ring by hand. Instead, you may need to have it cleaned with an ultrasonic cleaner. And be aware that a lot of accumulated dirt can be harmful to the setting of your ring as the dirt creates additional friction, making the metal wear more quickly. 7. Gold settings can be cleaned with polish while sterling silver can be polished up with a silver wipe. At all times, be gentle around the diamond and look for any signs that it is loose within the setting to avoid any kind of problems later on. You’re likely going to flash your diamond, right? Who wouldn’t! While you may want to show your diamond to the world, there are a few things to be aware of. It’s possible to lose the stone or cause damage to it if you’re not careful. 1. Be sure it’s a good fit. If your diamond ring is a little loose, it could slide off your finger as you’re washing your hands or throwing something to a friend. There are ring guards that you can purchase to help create a better fit. 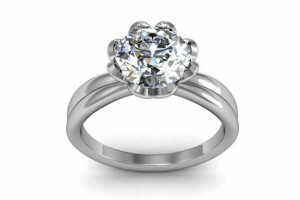 You can also bring your ring to a jeweler and have the ring resized. 2. Avoid catching it. Depending on the cut of the diamond as well as the prongs of the setting, the ring could catch on some materials, such as sweaters or lace. If it does catch on something, avoid pulling it away too quickly. Be gentle as you don’t want to bend a prong. If you do bend a prong, bring it into a jeweler immediately so they can repair it. Otherwise you risk losing the diamond. 3. Stay out of the dirt. While it is possible to clean your diamond ring, it’s better not to get into any situations where you have to. Whether it’s playing sports, gardening or getting into any other dirty environment, take your ring off for safe keeping. This will ensure the diamond doesn’t become loose and the setting doesn’t get scratched. It’s possible that you’re not going to wear the diamond ring wherever you go. If it’s not an engagement ring, you may only want to break it out on special occasions. Due to the value of the ring, it’s not something that should simply get set on the top of a dresser. Clean the ring before putting it away. This will ensure that debris doesn’t get encrusted into the setting, making it hard to get out later. Polish the surface and place the ring in a microfiber or felt bag. Almost every jewelry store sells fabric envelopes that the ring can be placed in. Store it inside a jewelry box until it will be worn again. Keep your diamond ring separate from other jewelry in order not to scratch it. If you have other pieces with diamonds, do not store them together as they may scratch one another. What Is the Best Diamond Color to Buy? What Should You Do If Your Ring Is Bent?